• This is for Yogis. • This is for Writers. • This is for people who are scared to write. • This is for people who love to write. • This is for learning more about yoga. • This is for learning more about writing. • This is for freeing your self-expression. • This is for your yogi brain and your writer heart. • This is for all of us who love words. • This is for all of us who love yoga. • This is for you and for me and for them and for us. This is the Yoga of Writing. 30Words30Days will expand and deepen your relationship to yoga and to writing in one month’s time. It is a passionate yet easeful commitment to your creative self. *This course is run entirely through a private Facebook forum. A new international community of Writer-Yogis. If you practice yoga, 30Words30Days will expand your knowledge of yoga and explore how the concepts mentioned in class resonate off the mat and in your daily life. If you are a yoga teacher, 30Words30Days will deepen your knowledge of key concepts in yoga, refine your ability to articulate these concepts, and set you up with weekly themes for the next 30 weeks of your teaching. If you are longing to write but don’t know how to begin, 30Words30Days will show you how. If you need structure and support, 30Words30Days will supply you with both. In my many years of teaching Yoga and Writing Courses, this is the only one I offer at this low cost. Why so low? Because I am delighted to make the Yoga of Writing and basic Yoga Philosophy available to the widest possible range of people. This will be my second time offering 30Words30Days. Last year we had over 150 participants in over 15 countries, and I am ridiculously excited about diving back into the creative energy that the course generated! I will be writing with you because I find that there is nothing like participating in a shared creative effort. The inspiration and support are amazing. If you participated in 30Words30Days last year, I invite you to join us again as an annual dive into your creativity. The words will be the same, but you will be different, so your writing will take on a new tone. Returning 30Words30Days students receive a discount, so you will only pay $25! The discount code will be posted in our previous 30Words30Days Facebook group. 30Words30Days is a great course to participate in with friends, as it generates group discussion and assists you in your commitment to your writing, so please invite your friends – I guarantee that you will have a deeper, more immersive experience because of it. It is a wonderful way to begin the new year. If you are interested in your Yoga Studio or your Yoga Teacher Training being a part of 30Words30Days, please contact me for a special group rate. This is a great holiday or New Year’s gift for you and a friend, and it will assist you in your creative commitment. 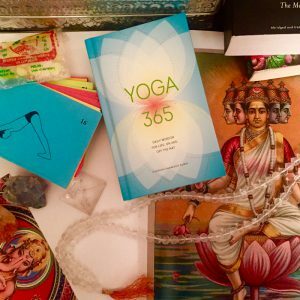 I spent the past two years writing and editing my book, Yoga 365, which was published by Chronicle Books Oct 2016. I wrote 1 entry for each day of the year. Yes, that is 365 finished pieces of writing! How did I write that many distinct pieces? I made a list, divided it up into months, made myself a schedule, and I wrote a little each day. And NOW, I am inviting you to join me in a shorter version of this process. I promise that you will be happily surprised with your output at the end of our month together. And I am thrilled to nurture your creative growth. My 30Words30Days dream is to include those of you who hesitate to invest in a lengthy or more expensive course because of doubts about the time commitment, about your writing, or about your finances. With these pressures lifted, we can freely experiment with our creative impulses, play with different types of writing, and entertain new ideas.